Thursday August 27th 1925 The girls hired a taxi to take Lydia to Peoria to have some dental work done. I read in forenoon and in afternoon wrote Ida, Mrs Smith at Orange Masshachuset, and replied to a letter from Joe Williams. The girls got home about four oclock. We were home in evening. Friday August 28th 1925 It was a warm day. Edith did washing and ironing. I rested in PM. Did a little writing. Mr Albers took us to the Cemetery after early supper and for a ride. We stopped up town awhile. Callers later. Saturday August 29th 1925 I rode up town with Edith and a friend early in the AM. They were going to Pekin. I did errands and walked home. Letter from Hattie. She says Fannie will reach home tonight. A letter from Warner McCall also. Wrote them and Joe Woolf in PM. Took the letters to the depot. George Alexander and wife with a lady I knew who was Lizzie McKee from Iowa City called in evening. 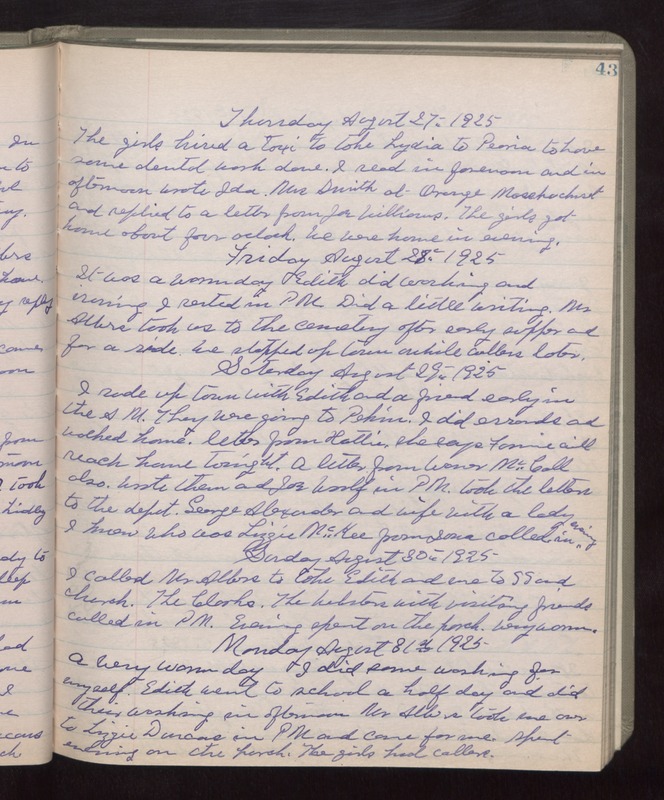 Sunday August 30th 1925 I called Mr Albers to take Edith and me to S S and church. The Clarks, The Websters with visiting friends called in PM. Evening spent on the porch. Very warm. Monday August 31st 1925 A very warm day. I did some washing for myself. Edith went to school a half day and did their washing in afternoon. Mr Albers took me over to Lizzie Duncans in PM and came for me. Spent evening on the porch. The girls had callers.